This is a continuation of a series of posts on the Fuji GFX 50S. You should be able to find all the posts about that camera in the Category List on the right sidebar, below the Articles widget. There’s a drop-down menu there that you can use to get to all the posts in this series; just look for “GFX 50S”. I’m going to be making some posts about the GFX- 50R going forward. Since the cameras are so similar, I don’t think I’m going to create a new category just for it, but rather lump those in with the GFX 50S posts. I’ve published a lot of material about focus shift in the native Fuji G lenses, and how to best deal with it when manually focusing, but there is still misunderstanding about that topic, so I’m gathering the relevant links into this post. First off, for any of this to be useful to you, you’ll have to know how to manually focus native lenses stopped down. Second, you’ll have to know an effective technique for precise manual focusing. Then you’ll want to know how much focus shift your lenses have, and how that shift relates to f-stop. The 23mm f/4 has little focus shift. Feel free to focus it wide open. The 45mm f/2.8 has a moderate amount of focus shift. Focus it at taking aperture until f/5.6, and then just focus at f/5.6. 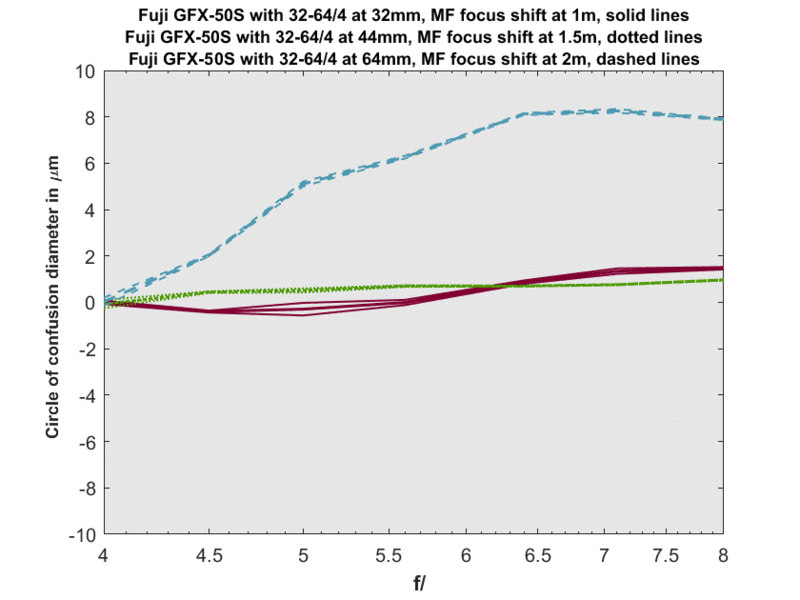 The 63mm f/2.8 has less focus shift than the 45mm f/2.8. Focus it at taking aperture until f/4, and then just focus at f/4. The 110mm f/2 has some focus shift. There is enough focus shift that you’ll want to focus this lens at the taking aperture at f/2 and f/2.8. All smaller apertures can be focused at f/4, or f/5.6 if you’re really picky. The 120mm f/4 has some focus shift. You’ll want to focus it at taking aperture until f/8 or so. The 250mm f/5.6 has little focus shift. You can safely focus it wide open. With the 32-64mm f/4 zoom, focus shift depends on focal length. At 32 and 44 mm, you don’t have to worry. At 64 mm you’ll want to focus at f/5.6 for that aperture and narrower ones. This is just an incredible service. Thank you! I am reminded of the olden days when Howard Bond shared his data on film reciprocity behavior. One wonders how much these estimates of focus shift may depend on the conjugate ratio. Usually they are done at relatively close distances. Photographing a metric scale obliquely, Photozone found a fair amount of shift with the Sigma Art 50mm, but with a large bookcase from a distance of several meters, I was unable to confirm the shift. The imperfect correction of SA at different conjugates might vary especially with internal-focusing lenses. A counter-argument is that the macro lens is as bad as any for shift. One would rather expect the f/2 to have more; weird, and a little concerning. I’d grab a couple of GF lenses and try it myself, but so far I have not succumbed to GFX disease. Probably the GFX100 will end that resistance, groan.